Rick Tegtmeier, CGCS, MG at Des Moines Golf and Country Club (right) with former North Course superintendent Tim Sims (left) and South Course superintendent Nate Tegtmeier. 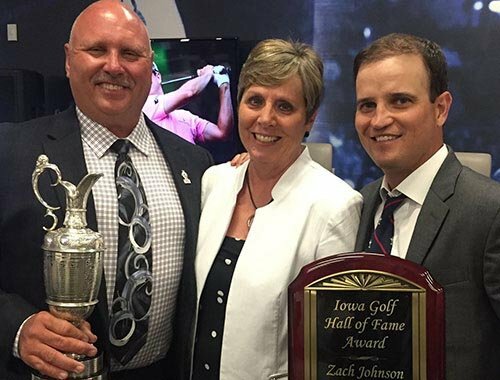 Below right Tegtmeier and wife Sherry help Zach Johnson celebrate his induction into the Iowa Golf Hall of Fame in 2016. Tegtmeier was one of four inductees named to the hall of fame this year. When the LPGA and the Ladies European Tour decided to bring the Solheim Cup to Iowa, Rick Tegtmeier, CGCS, MG, wanted to make sure it was an experience that players, organizers and those working the event would never forget. Tegtmeier's efforts in staging Des Moines Golf and Country Club and simultaneously highlighting the greenkeeping abilities of his team and volunteers during the 15th edition of the Solheim Cup in 2017 left a lasting impact on many involved with the tournament. It also was one among the career achievements that recently resulted in Tegtmeier being named among the latest group of inductees to the Iowa Golf Hall of Fame. "My whole goal was to shine the light on the superintendents who worked for me, their efforts, my crew and other Iowa superintendents who volunteered for the event," Tegtmeier said. "Many don't realize how good they are, but what they do matches every other superintendent in the country, but people don't know that because they don't see it on TV. To do that for them was a big deal for me." Tegtmeier, who was named winner of the 2017 TurfNet Superintendent of the Year Award, presented by Syngenta, was among four named to this year's hall of fame class that also included Jill Blackwood, a champion for women's golf in Iowa; Sean McCarty, a three-time high school state champion who also led Iowa to the 1992 Big 10 championship before embarking on a career as a professional; and Pat Wilcox, who was elected posthumously for his endeavors on the Iowa golf scene in the 1930s, '40s and '50s. Administered by the Iowa Golf Association, the Iowa Golf Hall of Fame includes a nominating committee that determines candidate eligibility of nominees, and a voting committee that consists solely of current hall of fame members. The seventh superintendent named to the Iowa Golf Hall of Fame, Tegtmeier and the other members of this year's class will be inducted at a time and location to be determined. Tegtmeier's efforts to stage a Solheim Cup for the ages did not go unnoticed. His volunteer staff included other superintendents from throughout Iowa and former colleagues and employees who had moved on elsewhere, and the event was a hit with other Iowans from around the state who turned out in droves to fill the gallery each day of the event. My whole goal was to shine the light on the superintendents who worked for me, their efforts, my crew and other Iowa superintendents who volunteered for the event. Many don't realize how good they are, but what they do matches every other superintendent in the country, but people don't know that because they don't see it on TV. To do that for them was a big deal for me. Those who nominated him for TurfNet Superintendent of the Year included PGA Tour player Zach Johnson, Solheim Cup Team USA captain Juli Inkster and then-Iowa Secretary of Agriculture Bill Northey. "Players from both sides raved about the course conditions, in particular the greens and how pure they were," Inkster wrote in a letter nominating Tegtmeier for the award. "The 2017 Solheim Cup was an epic and historic display of women's golf played on an unbelievable state at Des Moines Golf and Country Club. I have been around a lot of golf for a long time, and can honestly say that the conditioning of the course for the Solheim Cup was among the best I have ever seen." A graduate of Hawkeye Community College with a degree in horticulture science, Tegtmeier, 59, has been in the golf business for 45 years and a superintendent since 1980. The recipient of the Iowa GCSA Distinguished Service Award in 2017, he has been director of grounds at 36-hole Des Moines Golf and Country Club for 12 years, and prepped there for six years as North Course superintendent under fellow hall of fame member Bill Byers. 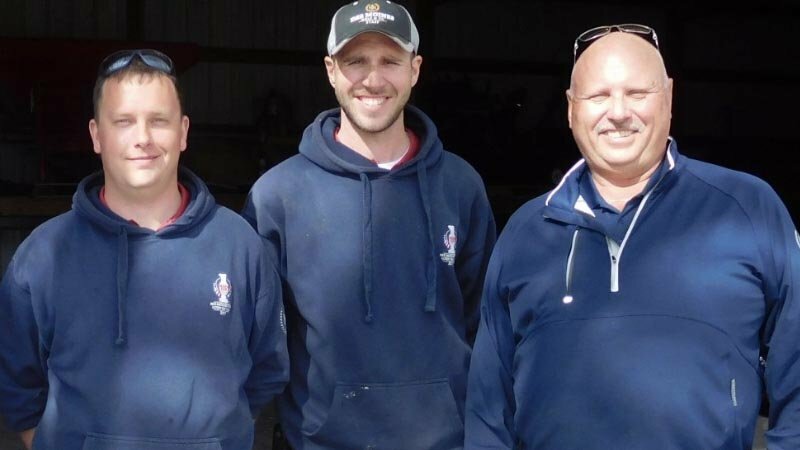 "It's an honor," said Tegtmeier, one of 74 certified golf course superintendents also certified as a master greenkeeper by the British and International Golf Greenkeepers' Association. "I'm only the seventh superintendent to be inducted, and to follow in (Byers') footsteps is pretty special." Other inductees include Champions Tour player Dave Rummells, former superintendent and longtime Standard Golf sales manager Steven Tyler, and Johnson, who won the Masters in 2007 and the 2015 Open Championship at The Old Course at St. Andrews. Johnson texted a congratulatory message to Tegtmeier after the vote was official. "In Iowa, this is a big deal," Tegtmeier said. "You don't get a lot of Masters champions or British Open champions telling you congratulations."